The Computers for Learning (CFL) program enables schools and educational nonprofit organizations to obtain excess computer equipment from federal agencies. The program's mission is to make modern computer technology an integral part of every classroom so that every child has the opportunity to reach his or her full potential. Through the Computers for Learning (CFL) program, the Civilian Board of Contract Appeals (CBCA) was able to transfer a total of 69 workstations to New Community for Children (NCFC). NCFC has been transforming the lives of children and youth in the District of Columbia for almost 30 years in the Shaw community by supporting academic achievement, developing life skills, fostering creativity and cultural awareness, nurturing spiritual connections and growth, and empowering children to succeed. NCFC offers a safe environment for children to participate in academic enrichment and recreational activities. Some of the programs and services offered by NCFC include the after school and advocacy program (A.S.A.P.) and Science/Technology/Engineering/Art/Mathematics (The S.T.E.A.M. Initiative). 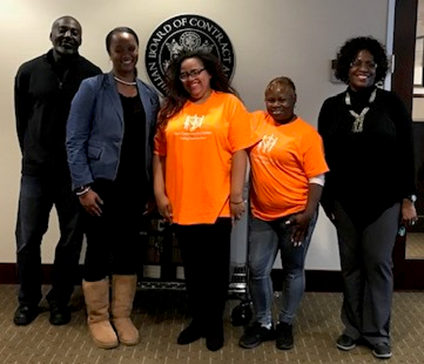 Special thanks to Anthony Graham (CBCA Computer Specialist), Kenya McPherson (CBCA Management Analyst), Demi Dunston (NCFC Administrative Assistant), Elizabeth Taylor (NCFC Teacher), and Rochelle Achoe (CBCA Contracting Officer), for all of their hard work in the transfer of the computer equipment. and Mr. Nakoneczny after their swearing in ceremony. The Board welcomes Ms. Nicole Giles and Mr. John Nakoneczny who have been selected to serve one-year appointments as Law Clerks for 2018-2019. Ms. Nicole Giles is a 2018 graduate of the George Washington University Law School, where she served as the Roger Boyd Scholar and Editor-in-Chief of the Public Contract Law Journal. 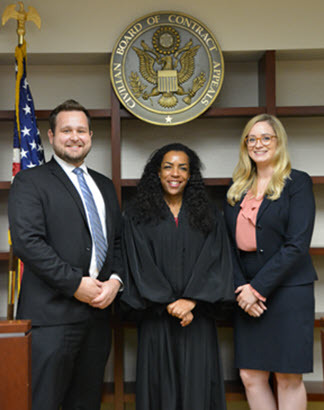 During law school, Ms. Giles attended GW's summer program at Oxford University to study international human rights and interned at the U.S. Department of State as the Squire Patton Boggs Foundation Public Policy Fellow. She also served as a judicial intern at the U.S. Court of Federal Claims and spent her final year working for the Government Contracts practice group at Bass, Berry & Sims. Mr. John Nakoneczny is a 2018 graduate of The George Washington University Law School, where he was a member of the Federal Circuit Bar Journal. As President of the Government Contracts Student Association, he encouraged student interest in procurement by organizing and promoting informational and networking events. While in law school, Mr. Nakoneczny served as a legal intern for the U.S. Department of Justice, Criminal Division, Fraud Section; the U.S. General Services Administration, Office of General Counsel; the Kings County District Attorney’s Office, Homicide Bureau; and, the Office of the Attorney General for the District of Columbia, Public Integrity Unit. Before attending law school, Mr. Nakoneczny was a business writer and, prior to this, an immunological research associate. The 2018 Summer Law Clerks are shown after being sworn in by CBCA Chairman, Judge Jeri Somers. As part of the summer program, the law clerks conduct legal research; attend hearings, mediations, and status conferences; and draft all manner of legal documents, including opinions, orders, and memoranda. 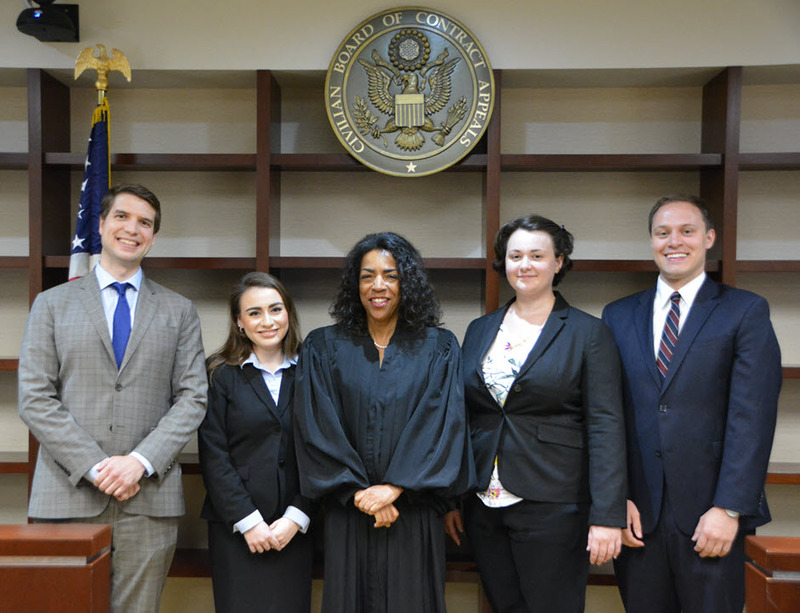 They are, from left to right, Samuel Van Kopp of Georgetown University Law Center, Jessica Nejberger of the Antonin Scalia Law School at George Mason University, Christine Milne of the Catholic University of America, Columbus School of Law, and Nathaniel Palmer of the University of Virginia School of Law. 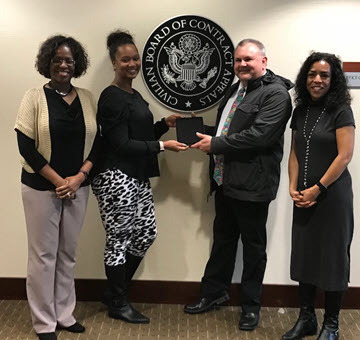 Mr. Brian Hoffman from Roland Park Elementary/Middle School in Baltimore, Maryland, accepts presentation of an iPad from the CBCA's Kenya McPherson, while CBCA Administrative Officer Rochelle Achoe (on left), and CBCA Chair, Judge Jeri Somers (on right) look on. The CBCA recently transferred its obsolete iPads to the Roland Park Elementary/Middle School in Baltimore, Maryland under the Federal Government's Computers for Learning program. The program provides recent model computers and related equipment to schools once the equipment is surplus to the Federal Government's need. 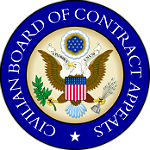 If Federal Government operations are curtailed due to a lack of appropriations, the Civilian Board of Contract Appeals will remain open for the purpose of accepting filings from parties during what has been termed the shutdown period. Any statutory limitations on the time within which a filing may be made will not be waived or tolled during this period. With the exception of statutory deadlines, each judge has the discretion to modify the deadlines established in a specific case that occur during and after this period. If you have any questions about the Board's operations during the shutdown period, please contact the Office of the Clerk at 202-606-8800 or the Office of the Chair at 202-606-8831.